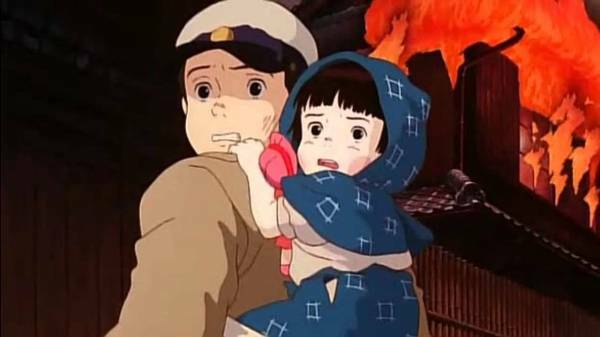 The classic animated movie and famous tearjerker Hotaru no Haka (Grave of the Fireflies) has two live action versions: the 2005 made-for-TV movie and the 2008 live action movie. Are these adaptations as good at provoking tears as the animated film? Let’s find out. Hotaru no Haka (Grave of the Fireflies) is originally a short story written by the Japanese author, Akiyuki Nosaka. The novel recounts his own experiences during World War II and how he witnessed his younger sister die due to severe malnutrition. It was made into an animated movie with the same title in 1988. Produced by Studio Ghibli and directed by Isao Takahata, the animated film became a huge hit and the story became the classic tale that it is today. In 2005, a live action TV movie was made to commemorate the 60th anniversary of the end of World War II. Aired on November 1, 2005, it stars Nanako Matsushima and Mao Inoue. The story of the siblings, Seita and Setsuko, pretty much remained the same. However, unlike the animated film, this live action version is told from the siblings’ cousin’s perspective. The movie starts 60 years after World War II showing the cousin, now old and grey, telling her granddaughter about the war. Because of this, we get to see the aunt’s side of the story. In the animated film, the aunt appears to be harsh and heartless to Seito and Setsuko. In the live action version, the aunt was initially kind. She only started being cruel when she found out that her husband had died in the war. She became increasing desperate in providing food for her family, and she took that stress out on Seito and Setsuko. The aunt also has more children in this version, many of them very young and the youngest suffering from asthma. Viewers get to see how she dealt with the issues of war and how in the end, she chose the welfare of her own children even when she was viewed as mean and selfish. This live action version is, in many ways, not that different from Studio Ghibli’s film. You already know what’s going to happen next, yet it is a whole new side of the same story. The movie is also less gloomy than the original animated film. It lacks a certain darkness that Studio Ghibli created so well. Another live action movie was made in 2008. It stars Reo Yoshitake and Rina Hatakeyama and was released on July 5, 2008. This live action version is pretty close to the animated film. The focus was on Seita and Setsuko and the aunt was selfish and mean right from the start. There are more flashbacks of happier times from when the siblings’ parents were still alive though. There are also a couple of minor characters that were added, like the schoolmaster who Seita had befriended. But this doesn't have any significant effect on the main story. This live action version is darker and grittier than the 2005 movie. You get to see a lot of bloody wounds and dead bodies, either pale and lifeless or black and charred. Still, it’s not as haunting as the animated film. Perhaps it is because the story has already been told that the live action versions cannot evoke the same magnitude of emotions, or perhaps Studio Ghibli’s version is too iconic that anything else becomes inferior in comparison. However, if you are curious enough, the two live action adaptations are good enough to watch. Watch the trailers of both the 2005 and 2008 Grave of the Fireflies live action movies below. We know Madhouse for Death Note and One Punch Man, Kyoto Animation for Haruhi Suzumiya and Clannad, and Studio Ghibli for basically everything they make. But what about their flops? Their biggest disappointments? Who remembers these clangers? Madoka Magica isn't your average magical girl anime. It explores realms of romantic ideals and delves deep into the nature of human desire. Viewers are forced to ponder whether there actually is a fine line between good and evil. Let's explore this complex theme through the analysis of Madokami. Noblesse: Awakening - Noblesse finally gets an ONA! Fans of the Noblesse manhwa can finally rejoice as one of the most popular webtoons at the moment finally gets an ONA - Noblesse: Awakening! Let's explore its pros and cons as well as the possibility of a full anime adaptation in the future! The return of the manga Hunter X Hunter provided a perfect opportunity to take a Look at The Love-Hate Relationship Between Togashi Yoshihiro and this readers.